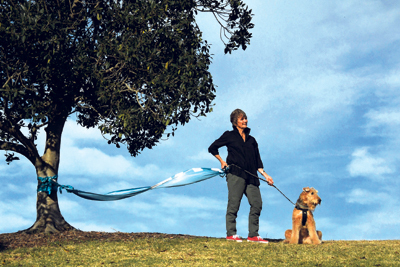 Glenys Waddell walks her dog in Sydney Park daily Photo: Lorrie Graham ©. Posted August 1, 2018 by Lanie Tindale & filed under Inner West Independent. Electricity company Transgrid plans to dig a deep three metre wide trench across Sydney Park to install a cable that is part of a project to increase available power to central Sydney. If approved by NSW Planning, the project would involve digging into contaminated landfill, removing trees, intruding into the park’s wetlands and disturbing wildlife. This would further increase environmental pressure on the park caused by WestConnex, which is building a massive interchange on the southern border of the park designed to carry an extra 60,000 cars a day into the CBD. This construction has already destroyed hundreds of trees and intruded into Sydney Park, which is the biggest regional park in this densely populated part of Sydney. The project, ‘Powering Sydney’s Future’, has been planned over several years but is yet to undergo a full environmental impact assessment. 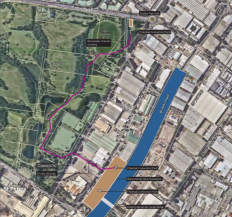 The City of Sydney opposes the route through Sydney Park. According to a City spokesperson, the Council was first informed of the project around 18 months ago. “At that time, the route was notionally along Campbell and Euston Roads within the City of Sydney local government area,” the spokesperson said. Campbell and Euston run along the southern and eastern boundaries of the park, respectively. 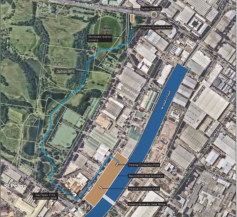 In June last year, Transgrid published a report which described six options under consideration, two of which involved building a trench along the Euston Rd side of Sydney Park. The report was prepared by AECOM in 2017, which also did the environmental assessment for all three stages of WestConnex. None of the options included a route through the middle of Sydney Park. Option 1 (Photo: Figure 16, 2017 AECOM Report). Option 4 (Photo: Figure 28, 2017 AECOM Report). 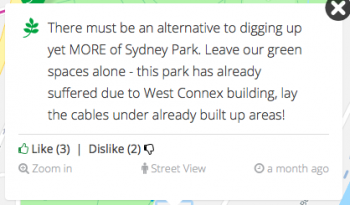 Ausgrid, which is currently installing a cable down Euston Road, previously found that taking routes through Sydney Park was “problematic due to issues associated with the rehabilitation of the site (as a consequence of its historical use as a landfill site).” The City of Sydney reiterated these concerns to Transgrid in March 2017. A Transgrid map published in June 2017 showed the cable trench running down Euston Road where a new Ausgrid cable is also being installed. But sometime between June 2017 and May 2018, Transgrid changed their plans. Transgrid is required to submit its proposals for adding electricity capacity to the Australian Energy Regulator. We reviewed a copy of AER’s decision. It approved a cheaper proposal and said that Transgrid’s earlier engagement with stakeholders in the electricity industry was inadequate. 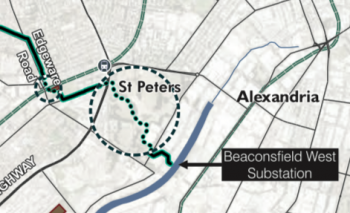 The spokesperson later agreed that this decision was not the reason for the change of route, but told City Hub that the route was identified in a May 2017 report. The report was not provided when City Hub requested it. City Hub asked for these detailed analyses but at the time of publication had not received them. The first public indication of the new route is in a Transgrid Community newsletter distributed to some residents in St Peters during May 2018. The newsletter includes a map showing the cable going along Addison and Edgeware Roads in Enmore, through Camdenville Park and along May Street to Sydney Park. The cable then enters Sydney Park near a children’s playground and crosses the centre of Sydney Park, cutting through the wetland zone and exiting near the south west corner of the park onto Euston Road. Map shown in a community newsletter from May 2018. The key to the map shown in the May 2018 community newsletter. The is also a social interactive map available online that began on May 3 before the AER decision on May 18. There are several comments on the map that are critical of the route. A “social pinpoint” map featuring the project’s route. Lord Mayor Clover Moore told City Hub that she is “very concerned about Transgrid’s proposal to run cables through Sydney Park and [has] asked staff to work with Transgrid to find alternative solutions. ‘Sydney Park is a vital green lung for residents who live in the City of Sydney and surrounding suburbs and it is already under threat from the State Government’s WestConnex toll road project,” Clr Moore said. City Hub was first alerted to the project by Glenys Waddell who has used the park since it opened 27 years ago and still walks her dog in it every day. She told City Hub that when another resident told her Transgrid was going to construct a trench through the park, she thought it was a mistake. Glenys Waddell Photo: Lorrie Graham ©. City of Sydney has asked Transgrid to consider alternate options, such as running the cable along Campbell and Euston Roads at the same time as Westconnex construction to minimise further disturbance to the local community. A spokesperson from the Council said they understand that Transgrid are reviewing the route options. Transgrid said it “is in continuing discussions with the City of Sydney regarding the potential impact of the proposed route on Sydney Park.” Transgrid did not indicate to City Hub that it was considering routes that do not enter through Sydney Park. The project requires approval by the NSW Minister for Planning before Transgrid can proceed with the project. An environmental assessment impact statement will be on public display in early 2019.